www.lynnlum.com: Sponsors Needed to Rescue the Sicko-Shopaholic. Sponsors Needed to Rescue the Sicko-Shopaholic. Shopaholic's going a little out of control. Lynn is crazy. Totally out of her mind. I was actually thinking of flying to Hong Kong for a weekend to shop, I was actually thinking of that. I know, I know, I know... I have did a little, just a little, really I promise, splurging at Vuitton on Saturday, that I was not suppose to. But I lost it before, I needed a replacement. 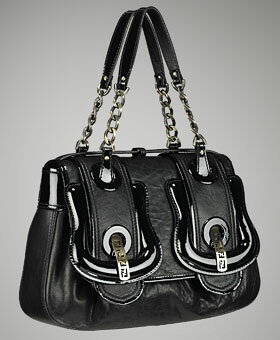 As for now, and it has been a long time, I need a black bag. It's utterly ridiculous for a bag-whore like me to not have a black number. I always go for colours, all different kind of colours, and then, keep going back to browns, all shades of browns, then repeat on the colours. Today, I've got the I-need-a-black-bag-syndrome again. Come on, let's double da B this time. Black Bag, Big Bag, Be Bad, Be Bold, B. Bag! Come on, Be the Boss, be my sponsor. Under the influence of your fanatical idea of shopping at eLUXURY, the Loony Lynn actually had attempted to do so. (Un)fortunately, they do not ship out of America. So now, good/bad news for yourself? what about net-a-porter..but i dunn think they carry fendi..
one time (da first time), i was nicely shopping and dumping stuff into the cart, totally unaware of shipping limitations, spent like hours selecting and deciding what i Have to have and what i didn't really need and then doing the currency calculation. after the many hours, only to find out that THEY DON'T SHIP TO MALAYSIA. maybe it's my connection but net-a-porter seems "slow" to load all the time.. is it just me??? Haha... June, we better be careful this Friday as the whole world knows where the both of us will be now. See you on Friday. Angel, before I really was against the idea of buying luxury goods online because I like to be in store, have a 'feel' of it and get the service before buying. I then finally changed my mind on buying this pair of Dior on eluxury but I can't. So I'll stop trying, no more online shopping for luxury goods. Everyone should just buy lingerie on victoriassecret.com Been shopping with them for years, good one. At least they send to Malaysia and Australia! But i need to try the bras before i know if i want them!!! oppss..i mean when ur"not at home"
The sizes at Victoria's Secrets are really precise. Try something from its sales, then you'll know if it fits. Haha... can't believe we're discussing about bras here. Crazy women, you girls I mean.